Shortly after my pumpkins are set, around day 14-15 I am experiencing some splitting where the stem meets the main vine (and gelatinous leakage). This has happened on each of the two or three pumpkins I have set on this plant. Any ideas on what might be causing this? I have packed the splits with some sulfur after cleaning. Does this spell doom for my pumpkins? Check to make. Sure the vine just before and under the stem doesn't have roots that are holding down the vine and causing stress on the stem. That is usually the problem with what you are describing. Thanks, that makes perfect sense, I cut the roots last evening at the stem, hopefully that does the trick. Thanks! 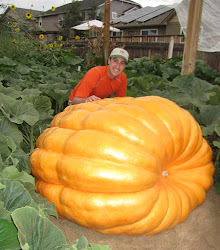 your pumpkin plants look amazing, im pretty excited with mine, i just pollinated a female about a week ago and shes swelling up nice, i rent and cant compost where i live to make tea or fertilizer do you have any suggestions for fertilizer or nutrients i could buy to use on my plants?